Technology in today’s world is advancing faster than ever before, and that means changes in how customers find and interact with your business. People are even using technology to find local stores that they could possibly find by just exploring their local area; 72% of consumers who did a local search visited a store within five miles. Technology isn’t just impacting how customers are finding your business; it’s making a difference in what customers expect when they walk into your store. Nowadays, finding a store without digital displays is almost a rarity. That doesn’t necessarily mean that everyone makes the best use of their retail digital displays, however. Here are a few ideas to help you make the most of your displays to help boost your business. Getting around: If you’re located in a mall, touchscreen wayfinding digital displays can help draw more customers to your specific storefront. Shoppers looking to find their way around can use these digital displays as a map, and having one near you keeps customers seeing your store. Limited time offer: Use your video walls and displays to show off your ongoing promotions in a way that passersby will more clearly notice. Shoppers will see these promotional items and offers more easily this way, and be tempted to check out the rest of your store as a result. Get creative: The more interactive you can make your displays, the better. Customers expect to engage with technology at every turn in today’s modern, tech-heavy world, and playing into that expectation can be helpful. For example, make it easier for customers to shop with a digital catalog on a display screen. 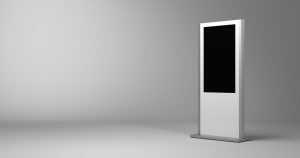 However, digital displays can be programmed for a variety of functions, so get creative with how you use these technological marvels. Customers want to be wowed with your use of technology, even if you don’t specialize in technology-based products. Using digital displays is just one additional way to demonstrate your company’s modern mindset and keep customers coming into your store. Want more ideas on how to integrate technology into your company’s marketing and branding? Contact Exposyour today for more information on how digital displays and other marketing tools can launch your company into the twenty-first century.